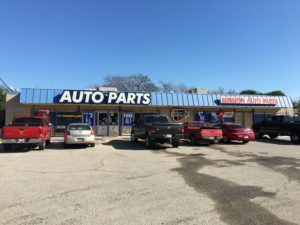 Mission Auto Parts and Machine shop is located at 2918 Roosevelt Ave. in the historic mission district of beautiful San Antonio, Texas and is a full-service auto parts and machine shop. In a marketplace where “cookie-cutter chain stores” have lost individual identities, we at Mission Auto Parts pride ourselves in our ability to be unique and to provide our clients with individualized service tailored to their needs. Whether you are a “do-it-yourselfer” or the manager of a large fleet of operations, we do our best to provide the very best, most professional service available, to you, our customer! Our well-qualified staff, with over 150 years of combined machine shop experience, and over 100 years auto parts experience, are here to help with all of your automotive part and machine shop needs. Whatever your service needs, from a turn of a rotor to the demands of high-performance engines, Mission Auto Parts is ready to meet them! Among the many services available are crankshaft grinding, engine re-boring, connecting rod resizing, resurfacing or milling cylinder heads, as well as pressure testing cylinder heads, along with welding and repairing aluminum cylinder heads. We balance and blueprint engines whether Stock, Mild Performance to all-out Racing Engines, as well as custom build engines. We believe our Quality, Integrity and years of Experience put into our engines speaks for itself. See You at the Racetrack.